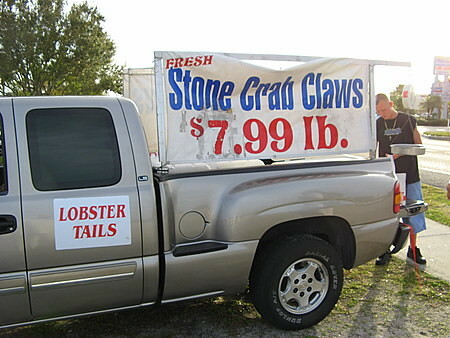 Originally, I was going to do a post about one of those really expensive Florida stone crab restaurants, like Joe’s Stone Crab in Miami, or Billy’s Stone Crab in Hollywood, but upon returning from lunch at Little Moir’s Food Shack in Jupiter (which we’ll get to later) we noticed an interesting truck in the parking lot of the Yankee Trader Produce Market. Want to know what to do with Stone Crab claws bought off the back of a truck? Click on the “Read the rest of this entry” link below for more. Stone Crab claws for $7.99 a pound? What a bargain! The guy selling the claws let us taste a sample (as clean and as tasty as can be) and sniff the freshness level of the claws, which smelled just like the ocean, in a good way. Apparently, he’s totally legit. 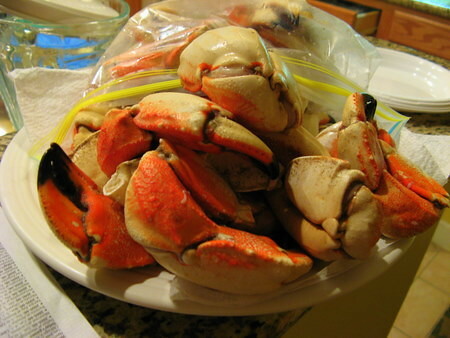 Stone Crabs, Menippe mercenaria are indigenous to the Gulf region and are a very tasty and expensive seafood delicacy, and are only avaliable mid-October thru Mid-may. Only the claws are harvested — the crabs are thrown back into the sea (with the smaller of the two claws remaining) to regrow its other claw. You can expect to pay upwards of $30 per plate for them. 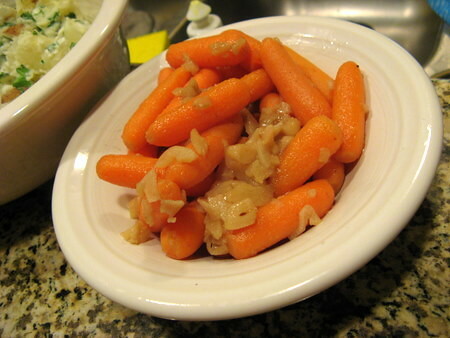 As you can see, these are sold along with the mustard/cream/mayo/worcestershire dipping sauce that was made famous by Joe’s Stone Crab restaurant. 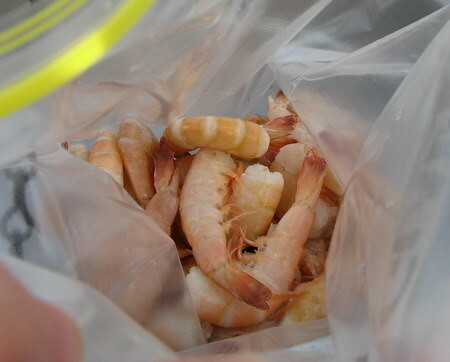 In addition to Stone Crabs, he had grouper filets, lobster tails, and these Florida Pink Shrimp, also known as “Pinkies”. 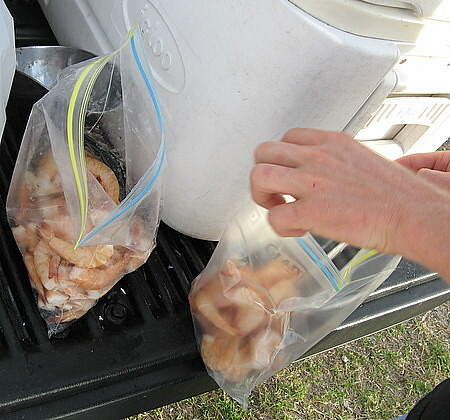 Bagging up the Pinkies and the Stone Crabs. I almost felt like I was engaging in some sort of illicit activity. 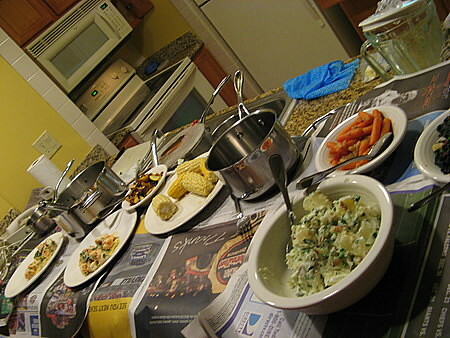 Here we have our timeshare condo’s breakfast bar set up just like an expensive Florida stone crab restaurant, with all the side dishes. 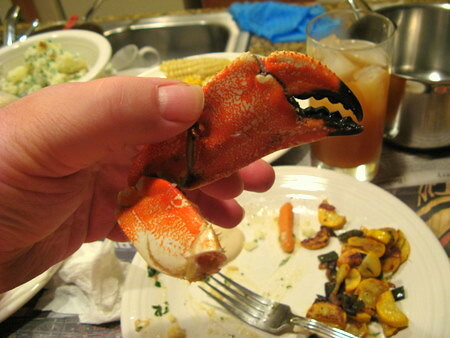 The small saute pans were used in lieu of mallets to crack the claws open. 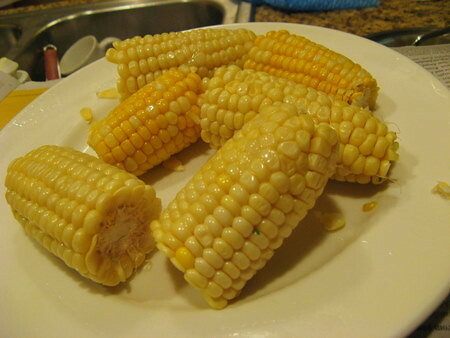 Fresh local sweet corn, steamed. 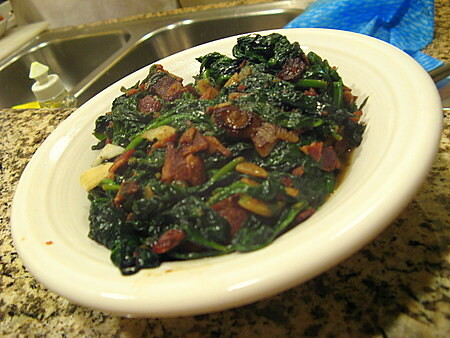 Sauteed Spinach with Bacon and Garlic. 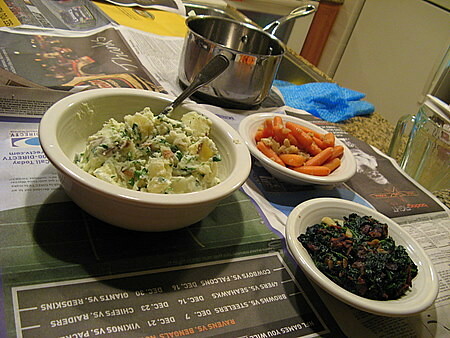 At a Stone Crab restaurant, it would be creamed spinach, just as you would find at a steakhouse, but we didn’t have any heavy cream and frankly, we didn’t miss it. 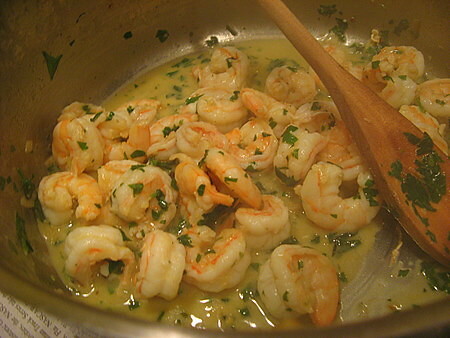 With the Pinkies, we did a simple scampi saute with butter, garlic, lemon juice and parsley. 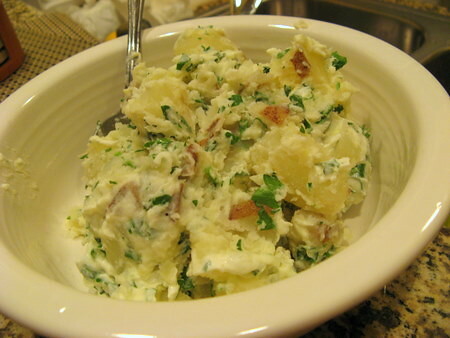 This was excellent, and we didn’t have to add any salt or pepper to it either (and well, we didn’t buy any for the timeshare) because we used salted butter and the heavy garlic made up for the lack of black pepper. 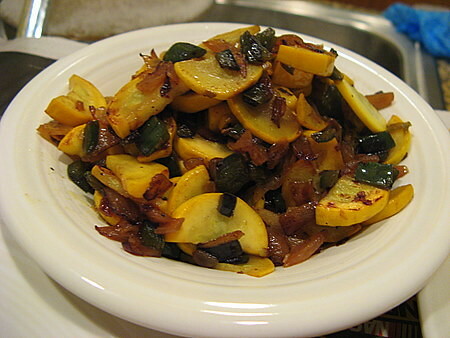 This entry was posted on Monday, December 4th, 2006 at 6:27 pm and is filed under Florida, Food, General, Links, Recipe. You can follow any responses to this entry through the RSS 2.0 feed. You can leave a response, or trackback from your own site. you’re in my old stompin grounds! i have an abiding affection for all those places (especially flagler museum) and the food. for good high end meal go to jean pierre’s in palm beach, great family excellend vittles, and there’s a decent market in west palm on sat mornings. though you seem to be headed north. We just got back to the NY area yesterday. Its now 40 degrees here in Northern Jersey. Ugh. Still got quite a few Florida posts though, so stay tuned. Man, I admire your courage to actually buy seafood from the back of a pickup truck. 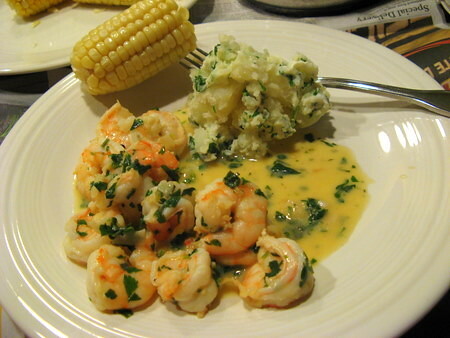 I see those around Houston too selling shrimp mainly, but I never try them. But hey, I guess if it smelled as good as it looked, then your good to go and it seems like no sickness befell you and you are safely back home :). Probably, but I have not eaten at Taco Bell in years either. Wow that is right across the street from my office building. How funny is that? Wow! This is my parent’s business. I can vouch for what Jon says about the cleanliness of the truck and the crabs – my hardworking mother is a clean freak! Your meal looks awesome and I’m glad you enjoyed the crabs. I’ve sold crabs off these trucks as well. We (my 3 brothers and 2 sisters) have all learned a lot working with the public this way. Happy 2007! 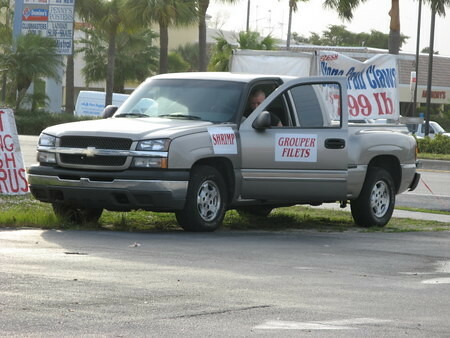 Does anyone know where I can find this truck or any others in the Miami area. I want to pick up some seafood for my trip back up to NY. Thanks. Bonnie if you come back to this site and see this. Will your parents ship? Just a little Dry Ice will do the trick. I live in Titusville FL . Leave a phone number on this site to call if they can do this. Those are not Florida stone crabs (FL has 2 species: Menippe mercenaria & Mennipe adina). Those appear to be Chilean stone crabs. Neat article though. This is my my parents business I now run it side by side with them any questions feel free to call me 954-226-3427 we operate in the tri county areas and we are trying to work something out with shipping. Do you still have your trucks along Federal Highway in Fort Lauderdale. I love Steve’s Stone Crabs! 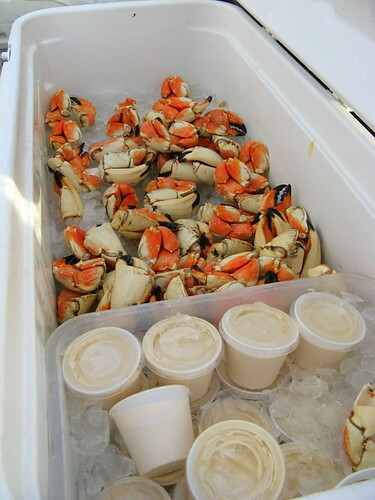 The pictures of the stone crabs in this picture are the New England stone crabs, my personal favorite, but my husband likes the Florida Stone Crab claws, which they sell for $9.99 a pound! WAY LESS THAN THE MARKET and ALWAYS fresh! The season for the Florida claws ends May 15th and doesn’t reopen until October 15th so check them out while you can! 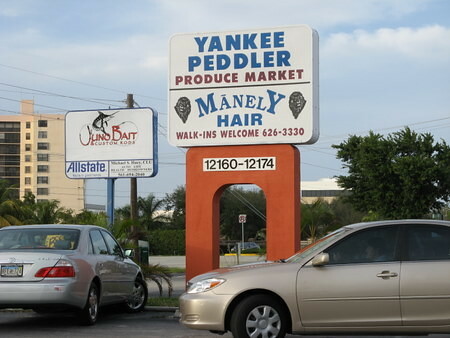 As well as being in Juno, Danny has told us that they’re also located a couple places in Miami, Ft. Lauderdale, and at farmers markets throughout South Florida. 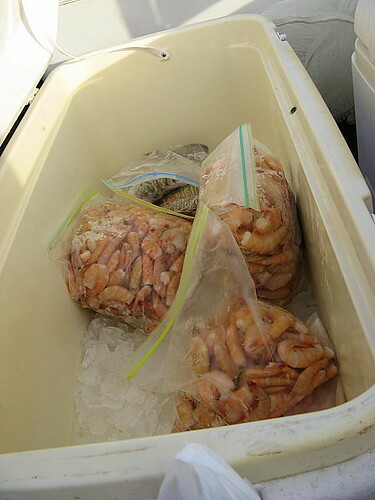 I’m pretty sure they sell the same products in every location: Florida stone crab claws, New England stone crab claws, fish, the Key West pink shrimp seen here, and lobster tails! Yummmm! If you call 954-574-1689, they update the voicemail every morning. 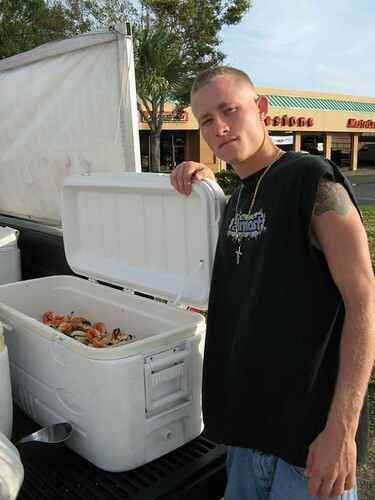 Thank you Steve’s Stone Crabs for providing us with fresh, gourmet meals at such a low cost! We look forward to buying seafood from you for years to come! I had these claws a few months back and the amount of meat on them was very disappointing:( when you crack them open many of them were virtually hollow! And the biggest ones were a bite at the most. Proceed with low expectations. What you bought are the hollow’s they are usualy cheaper than the solids. You can ask the seller and he will tell you which he has. I just bought some on 87 ave but I asked him and all he had was hollows. The claws in the picture look like Jonas stone crabs from Chile. 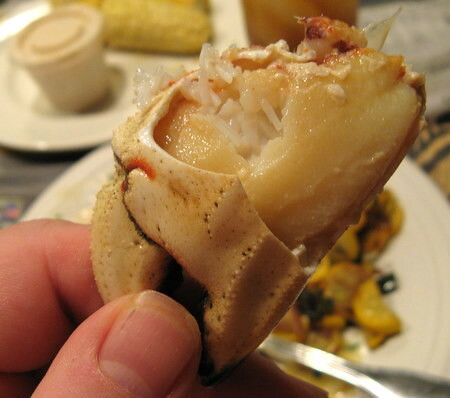 They have rough lines on the shell, and the shell is slightly heavier than the Florida’s stone crab. They are cheaper than the Florida but you can get them when the Florida are off season.